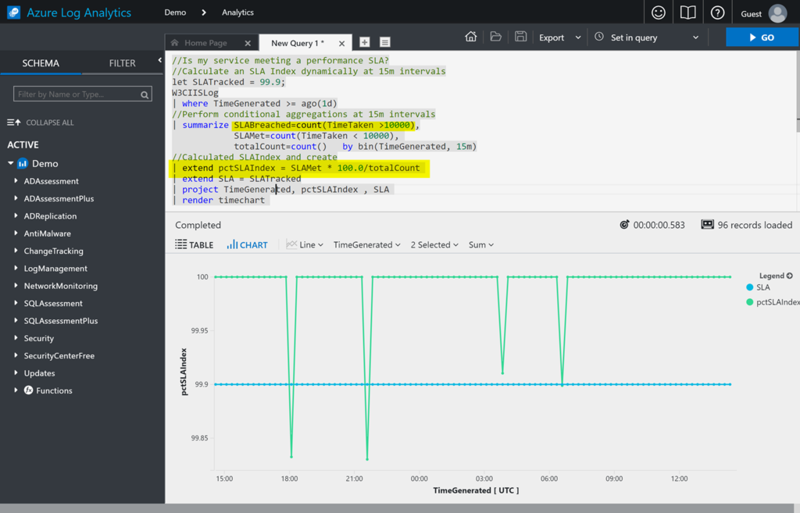 The Azure Log Analytics service is rolling out an upgrade to existing customers today – offering powerful search, smart analytics, and even deeper insights. 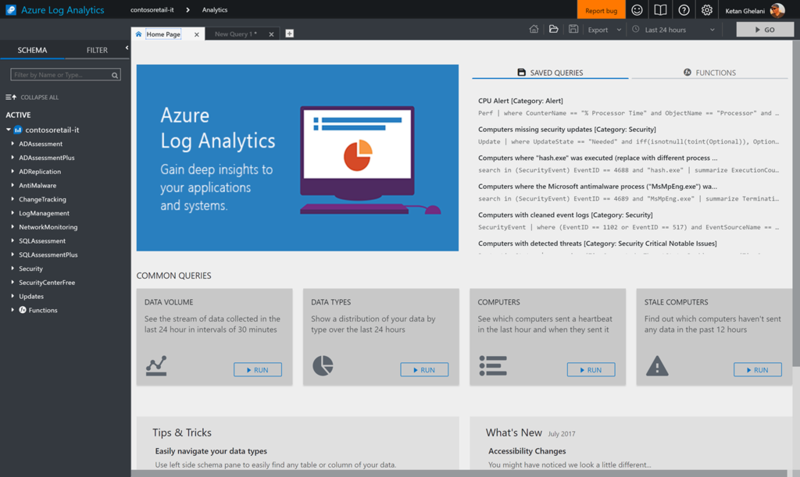 This upgrade provides an interactive query language and an advanced analytics portal, powered by a highly scalable data store resembling Azure Application Insights. This creates a consistent monitoring experience for IT operations and developers. This upgrade opens endless possibilities, but here are some of the brand new key capabilities available immediately after the upgrade, which takes only a few seconds, in most cases. The query language provides powerful search, query time field extractions, calculated fields, joins and unions, as well as rich date time operators, string operators and native JSON support. The query language also supports let statements, lambda expressions and comments in queries, an extremely important feature to modularize the queries, especially when sharing queries with colleagues or using them for live site support and troubleshooting. 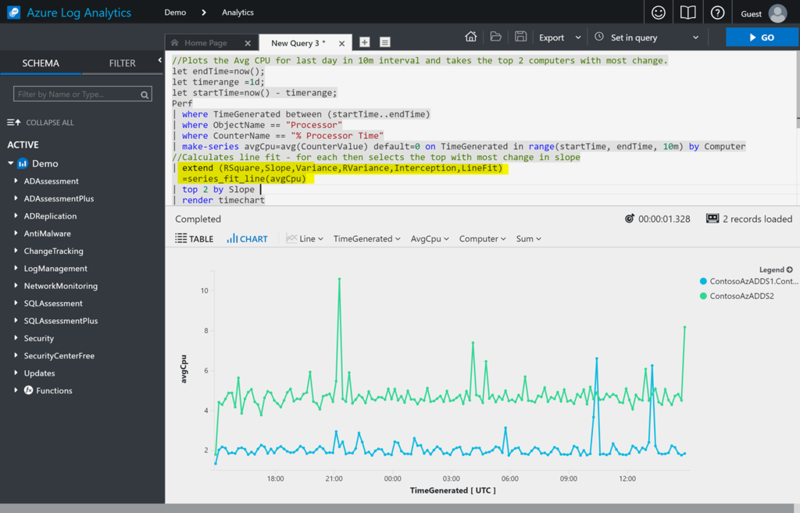 The query language offers flexible machine learning constructs and time series functions to help customers get deeper insights into their data. For instance, the time series functions help analyze CPU performance from hundreds of computers and select the top N based on usage spikes. 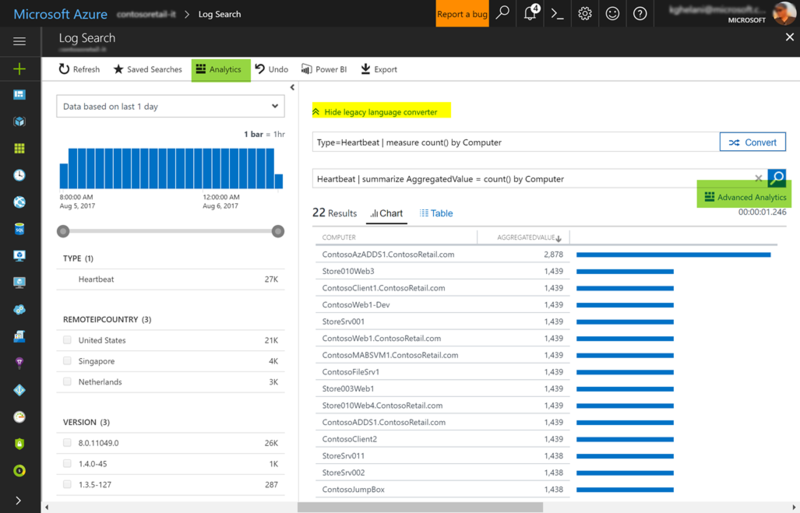 There are numerous other capabilities included in the language, which can be further explored in the Azure Log Analytics resource. Now let’s look at some examples for these, in the context of scenarios. All of the queries shown in the examples below were not feasible in the previous query language. This query calculates whether a service-level agreement (SLA) was met based on IIS call duration. To try it for yourself, click to run the query. This example using joins, shows a list of missing security updates, for computers with a high severity security alert detection for the last day. To try it for yourself, click to run the query. Here is another example using time series analysis for analyzing the CPU performance of several computers and narrowing it down to the two most relevant. To try it for yourself, click to run the query. The Advanced Analytics portal gives you the best experience for writing interactive ad hoc queries, whether it is for troubleshooting, diagnostics, analyzing trends or creating quick visualizations. This game-changing experience provides multi-line editing features with context-aware syntax highlighting and powerful built-in visualizations. You can save and share queries and export data to Excel. 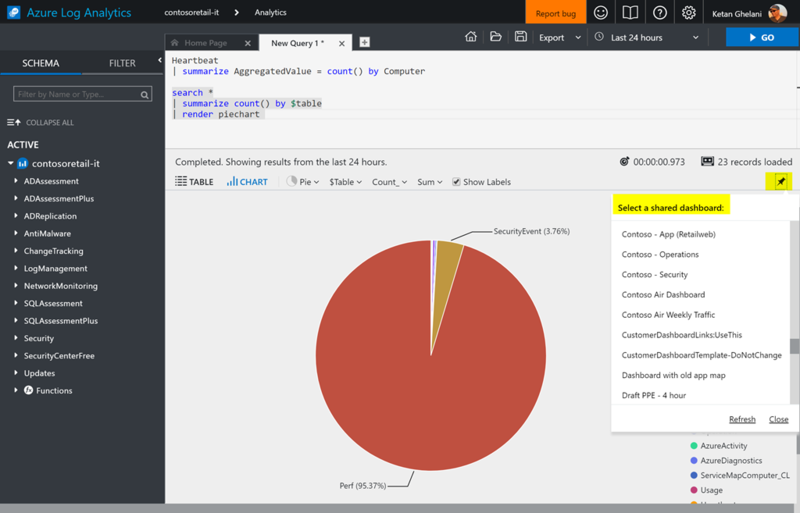 Now with one click, create a quick visualization on Analytics portal and pin the visualization to a shared Azure Dashboard. This enables you to create a single pane of glass across different workspaces, Azure resources and applications. With this upgrade, you have a much more powerful integration with Power BI Desktop, the same type of integration as in Application Insights. You can take advantage of additional Power BI visualizations, publish and share them with your colleagues on PowerBI.com and enable automatic daily reports. Finally, you can now integrate with Microsoft Flow and Azure Logic Apps, enabling you to create business flows, notifications, and much more. This is probably the simplest upgrade process you’ll experience. Within the application you’ll see a banner prompting you to upgrade, and with just one click, it will enhance your workspace – automatically converting all your artifacts, such as saved searches, views, alerts, and computer groups. Later, all non-upgraded workspaces will automatically be upgraded to the new query language and the platform. 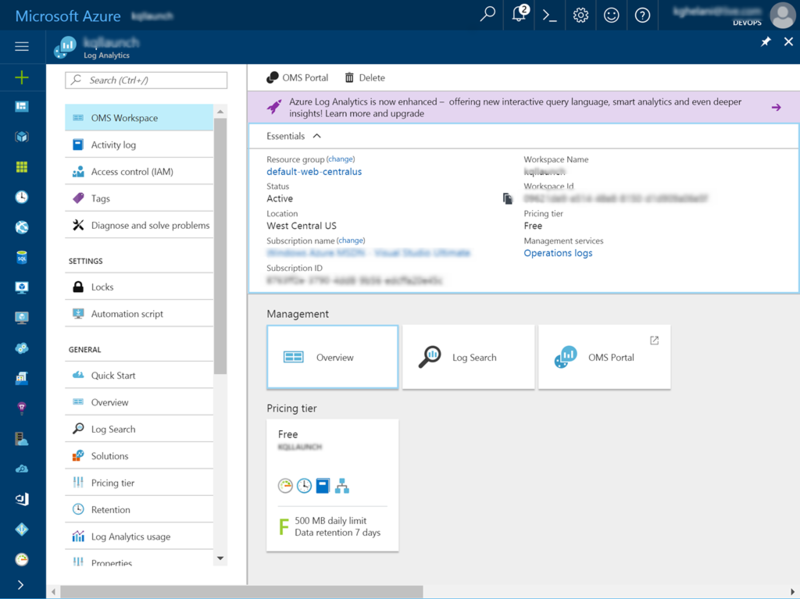 Learn more about upgrade process and FAQs in Azure documentation. 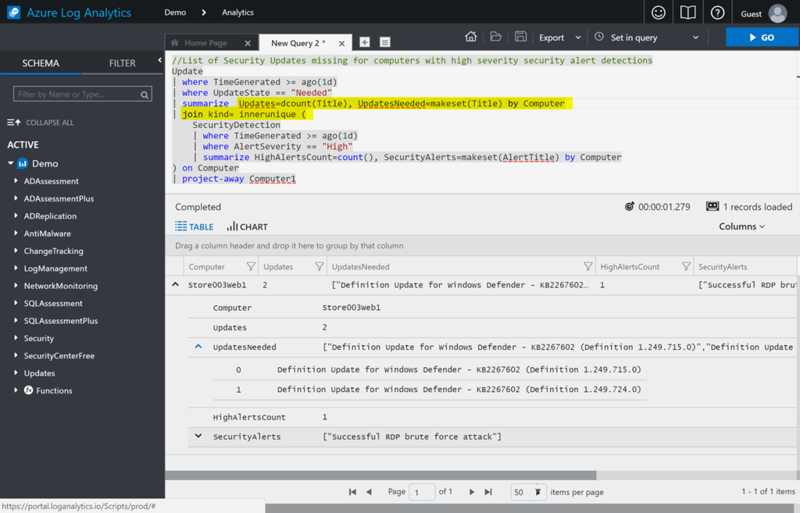 The Log Search page also provides a side-by-side experience with the old query language enabling you to learn and ramp up on the new query language. The main reason for a rollout upgrade vs automatic upgrade is to give you time to learn and ramp up at your own pace. The language documentation site includes extensive language reference, tutorials, examples and cheat sheets. A full-featured demo environment, enables you try out any queries. We are also launching a community site enabling you to interact with other product users, as well as the product team, with questions regarding query language. The upgrade enables an assortment of new capabilities and customers are already taking advantage of them. Over the last week and half, during the soft launch period, hundreds of customers elected to upgrade their workspace, totaling in more than 1,000 enhanced workspaces. Upgrade your workspace today and start using the new powerful search and query language to gain deep insights into your data! Register now to join us for a webinar on August 17, 2017, where we will share more details and demos of this improved experience.